Kayla Brathwaite '19 stands in formation between moves. Photo by Giovanni Santacroce. Black History Month events also included documentary screenings, student-led workshops exploring "blackness" as a social identity, a community concert, and a performance of the play "Renaissance in the Belly of a Killer Whale." With no music to guide them, the D.O.P.E. 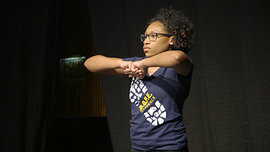 Steppers at Ithaca College stomped their feet, clapped their hands, chanted call-and-response phrases, and hit their chests and legs to create a precise, unified rhythm with just their bodies. The group’s name stands for Dedicated, Overachieving, Precise, and Entertaining, and that definition showed as the team took the stage at Step Fest, a celebration of dance for Black History Month. The origins of step-dance come from African foot dances, but the style has other influences too. Step Fest also showcased other forms of music and dance influenced by African cultures. The event featured guest performances from Pulse (a hip hop team), Ground Up Crew (a breakdance team), Island Fusion (an Afro-Caribbean dance team), and IC Beat Boxing. Marshall is also hooked on the performing aspect of dance. “It inspired me to channel my energy into something productive,” she said. Dance has the unique ability to unite people, despite how similar or different they may seem. Both Ground Up Crew and the D.O.P.E. Steppers saw this at Step Fest. The D.O.P.E. Steppers also valued the opportunity to connect with both the audience and with other organizations.